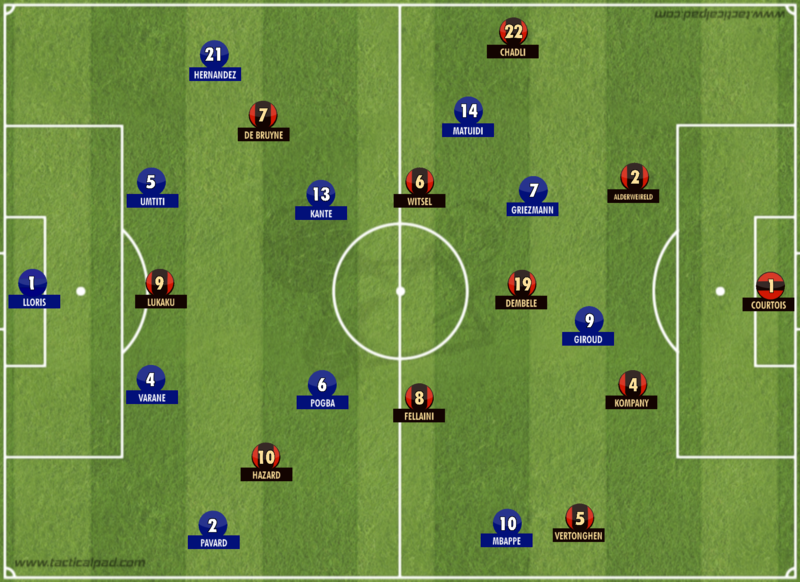 Siyang Xu provides us with a tactical analysis of the World Cup semi final that ended France 1-0 Belgium. France sealed their place in the World Cup final for just the third time in their history after a narrow victory over Belgium on Tuesday. As is common in the latter stages of knock-out competitions, the reluctance of both teams to give anything away made for a cagey game with few risks taken, inescapably creating a situation where the first goal would essentially prove decisive. With both sides desperately trying to avoid being the team that makes the crucial first mistake, it is probably unsurprising that the source of the winning goal ended up being a set piece; a detached moment of attacking freedom away from the rigid, careful flow of open play. Belgium: Courtois// Chadli – Alderweireld – Kompany – Vertonghen// Dembele – Witsel – Fellaini// De Bruyne – Lukaku – Hazard. After Roberto Martinez’s tactical surprise in the quarter final against Brazil – starting Romelu Lukaku out wide while using Kevin De Bruyne in a more central, ‘false 9’-type role – all eyes were on Belgium to see what the ex-Everton manager had in store for this game. The bombshell turned out to be further back the line-up this time, with the inclusion of Nacer Chadli at right back, an unorthodox move likely with the intention of creating a greater attacking threat down that flank against the more defensive-minded Blaise Matuidi, who returned to the French side following suspension in the previous round, and Mousa Dembele in midfield, who made just his second start of the tournament. The differing profiles of the two Belgian full backs – a natural midfielder in Nacer Chadli on the right, and the centre back in Jan Vertonghen on the left – created an asymmetrical dynamic to Belgium’s build up. 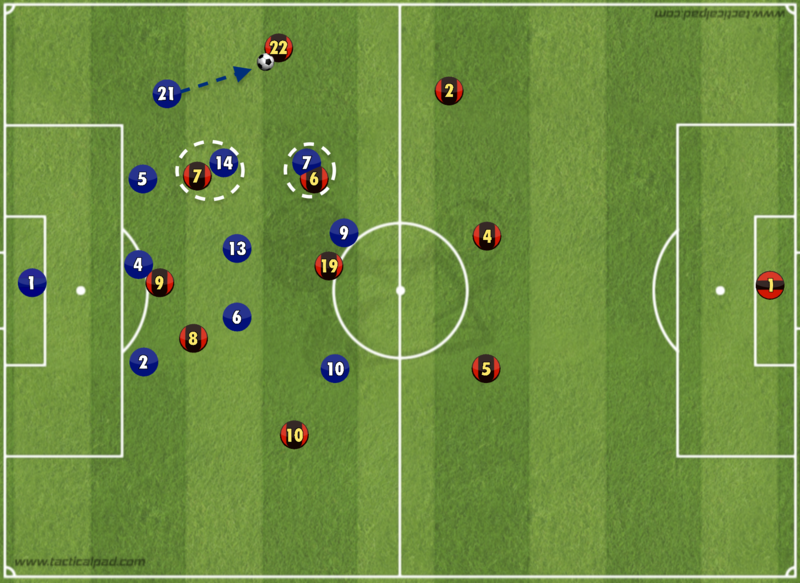 This meant that Belgium’s shape in possession resembled a 3-4-3, rather than the 4-3-3 in which they were defending. The reasons behind this adjustment are likely to be two-fold. Firstly, the biggest threat of this French side is in transition, and their counter attacks typically run through the rapid Kylian Mbappe down the right. Protecting against this would probably have been at the forefront of Martinez’s thinking, and the inclusion of a defensive-minded left back who rarely ventured forward, and instead stayed level with the centre backs, would reduce the space that Mbappe potentially had to burst into. The second reason has already been alluded to: the profile of the players down France’s left wing. Neither Matuidi nor Theo Hernandez are particularly attack-minded, and subsequently the left flank is rarely used in French attacks, especially in transition. It was therefore safe to push Chadli high and wide, a move that would pin France back as far as possible on that side whilst simultaneously enabling De Bruyne to operate further inside in dangerous pockets of space between the lines. Whilst the Belgian structure was theoretically sound and posed multi-dimensional threats to penetrate the French defence, the reality turned out to be quite different due to the strong organisation of the French defensive block. Nicknamed “the water-carrier” in his playing days for his uninspiring but effective work off the ball, it is perhaps unsurprising that Didier Deschamps has built a team whose biggest strengths lie out of possession. Deschamps deployed a low 4-3-3 block, with the wingers making a three-chain on the first line rather than dropping into the more common 4-5-1 shape in order to try and pin Belgium back with the threat of Mbappe and Antoine Griezmann in transition. The two lines of three naturally made the centre of the pitch tight and compact, and the positioning and shifting of both the first and second lines were effective in blocking passing lanes through the centre. The defensive efforts of Olivier Giroud, who was tasked with the job of marking Dembele out of the game, were particularly important. Not only did Giroud diligently maintain awareness of Dembele’s whereabouts, constantly checking over his shoulder to make sure he was blocking the passing lane from the defenders, he also persistently pressed from behind when Belgium did manage to break the first line, rushing Dembele’s next action and often forcing him to play a pass back to the defenders. 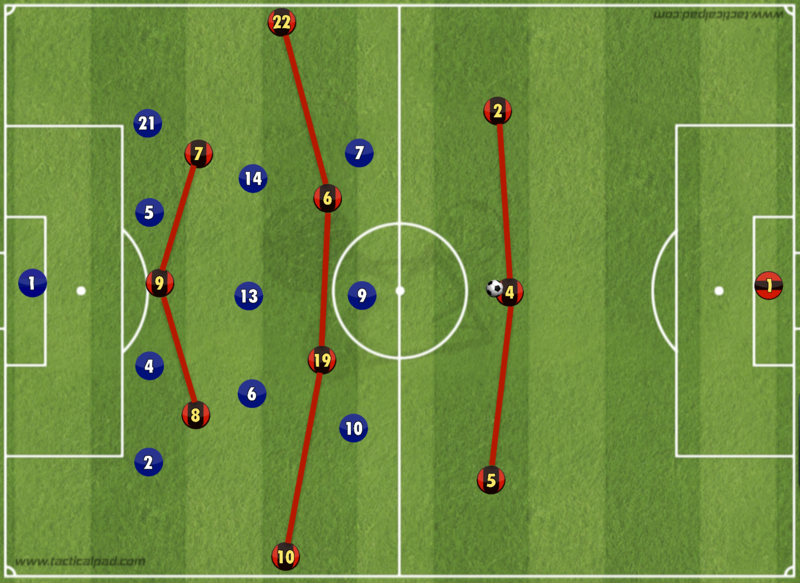 This helped France to lock down the centre of the pitch and essentially direct Belgium into wide areas, where the team was ready and prepared to pounce. On the right, Benjamin Pavard maintained a close distance to Eden Hazard at all times, allowing him to press as the pass was travelling and thus be able to put Hazard under significant pressure as soon as he received the ball. It is inevitable when up against a player of Hazard’s talent that there were occasions when he managed to find a way to turn – the Chelsea winger is arguably the best in the world at defying pressure from behind – and it was during these moments where Hazard was able to run at Pavard 1v1 or combine with De Bruyne that Belgium looked most dangerous in the first half. Nonetheless, France generally did a good job of limiting the space Hazard had to attack and essentially forced him to come up with moments of magic against numerous defenders to unlock the door; ultimately the best thing you can do when up against a mercurial talent like Hazard, as it is impossible to stop him getting on the ball for the entire 90 minutes. The tight marking of Pavard on Hazard generally had its desired effect, guiding the majority of Belgium’s build up towards the other wing where Chadli was left more open than Hazard. The false sense of security was enough to fool the Belgians into thinking they had a route to progress the ball, when in reality the French players were primed to press as soon as the pass was played. Deschamps’ men would rapidly shift over as a compact unit to block off the surrounding space whilst the nearest player applied pressure to the ball, denying Chadli the option to pass inside while also lacking the 1v1 ability to beat his man. The result was regular turnovers or simply forcing the ball back to the first line, keeping the ball far away from France’s goal. This inevitably led to slow and uninspiring Belgian possession for much of the first half, but with France equally unwilling or unable to create chances through their build up, the game sunk into a cautious stalemate. With France happy to let Belgium have more of the ball – safe in the knowledge that they were merely circulating possession in harmless areas outside their block – their main threat came on the counter, a situation for which they were well prepared. It was clear that there was a plan for Paul Pogba to look for the runs of Mbappe as soon as possession was turned over, seeking to expose the space behind the Belgian defence before they had time to re-organise. 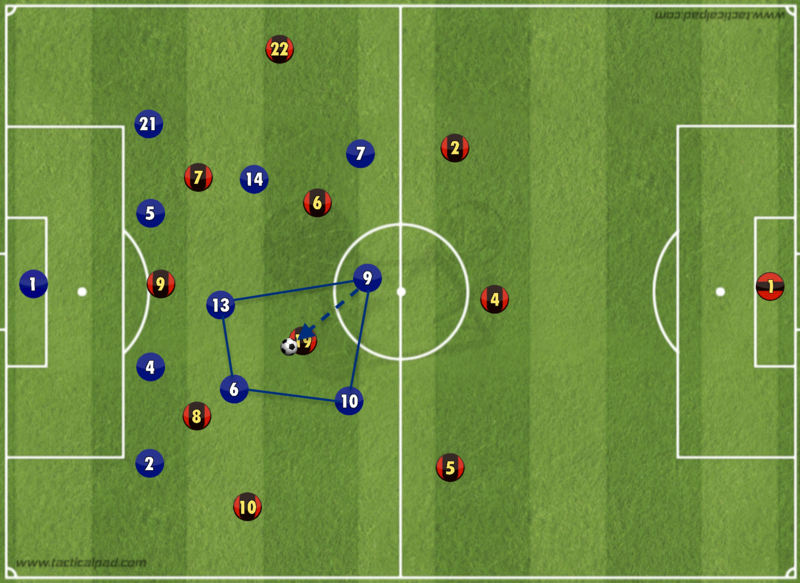 Griezmann also took up deeper and more central positions when Belgium were attacking the box, placing himself in pockets of space between Belgian players where he could collect loose balls from clearances. This not only primed him to be able to immediately drive centrally through the opposition, but also naturally attract pressure towards the ball, in turn freeing up more space elsewhere for Mbappe to exploit with his speed. In the end, neither team were quite able to engineer a clear enough chance from open play, and it was Samuel Umtiti’s header from a corner six minutes into the second half – a corner that arose after France finally managed to disorganise the Belgium defence and create an opening that led to a blocked shot – that broke the stalemate and secured France the crucial opening goal. For the remainder of the game, Deschamps’ men showed no interest in attacking and focused on protecting the narrow lead they had. Their narrow block naturally invited crosses from wide areas, but Umtiti, Raphael Varane and also Pogba, who did an excellent, disciplined job in man-marking Fellaini and nullifying his Manchester United team mate’s aerial threat, were able to repeatedly head clear ball after ball. With Belgium making fewer and fewer inroads centrally, their two key creative players, De Bruyne and Hazard, naturally started drifting deeper and deeper to get on the ball. Whilst this did allow their best players to be in possession, a disconnect between the deeper and more advanced players began to develop, almost splitting the team into two halves, and it became impossible for Hazard or De Bruyne to initiate the sort of combination play and passing patterns that could disorganise the French defence. Martinez attempted to adjust by bringing on fresh legs, but ultimately failed to turn the tide of the game. The introduction of Dries Mertens and Yannick Carrasco out wide may have even been counter-productive, as it ultimately forced De Bruyne and Hazard into congested central areas where they were unable to receive the ball whilst facing forwards towards goal. Keeping De Bruyne out wide may have enabled Belgium to utilise his immense crossing abilities – especially as crossing was Belgium’s only route to goal anyway – whilst Hazard tends to be more effective when receiving the ball in a wider position. The increased amount of time and space out wide allows Hazard to begin his dribble and build up momentum, before coming inside and looking to combine off the central players, causing disruption to the opposition’s defence in the process. However, when he receives the ball centrally, he is almost always pressed immediately due to the close proximity of opponents and therefore cannot begin to dribble, meaning it is almost impossible for him to go on those trademark runs that not only pull opponents out of position, but take them out of the game too. In the end, Belgium were ultimately unable to break France down. Their key players were unable to get them over the line, with De Bruyne struggling to flourish in the tight spaces within France’s block and Hazard not quite being able to open up a clear shooting opportunity, despite his best efforts to aggressively attack Pavard early in the game. Given France’s defensive organisation and Deschamps’ low-risk approach throughout the tournament, the match was always likely to be decided by either a mistake or a set piece, and in the end, it was through the latter that Umtiti was able to give his country the perfect opportunity to avenge their EURO 2016 final loss whilst ending the hopes of Belgium’s ‘Golden Generation’ of winning football’s biggest prize.